Kosherfrugal.com - Frugal Living in Israel: Printable Coupon - Fuze Tea! Here's a new printable coupon for you! 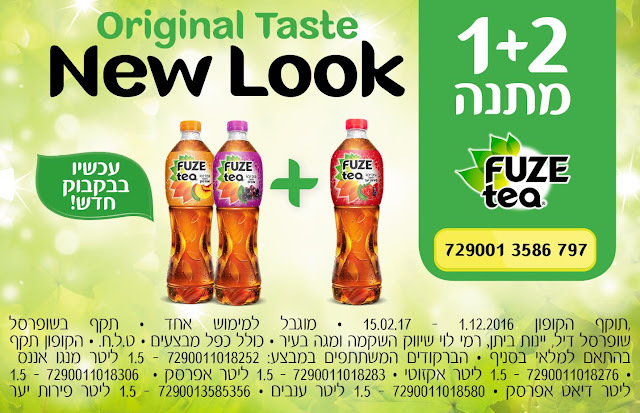 Fuze Tea: Buy 2, Get 1 FREE! Valid at Shufersal, Shufersal Deal, Yeinot Bitan, Rami Levy, and Mega Ba'Ir. 1.5 L bottles - Mango-Pineapple, Exotic, Peach, Diet Peach, Grape, and Berry Flavors.